In a letter sent Thursday to LIRR president Phillip Eng, seven state senators informed the railroad chief of their intention to hold public hearings about on-time performances. In a letter sent Thursday to LIRR president Phillip Eng, seven state senators, including the chairs of the Senate Committee on Corporations, Authorities and Commissions and the Transportation Committee, informed the railroad chief of their intention to hold the hearings and to “invite and encourage” his participation. Speaking at the Rockville Centre LIRR station Thursday morning, Sen. Todd Kaminsky (D-Long Beach), who has led LIRR reform efforts in Albany, said the letter to the LIRR aims to make clear the new Democratic majority Senate aims to “hold its feet to the fire” — something, he said, previous legislatures did not do. 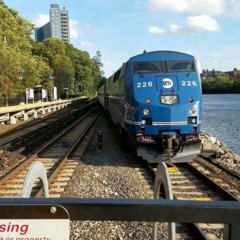 The senators' call follows a particularly difficult year for the LIRR, which through November, was on pace to record its worst annual on-time performance in nearly two decades. In the first 11 months of 2018, delays exceeded the previous year by more than 3,000. The number of trains canceled and average length of delays also grew significantly. The new year got off to a rough start, as the LIRR found itself investigating two train derailments in the first week of 2019. The LIRR also has dealt with numerous delays caused by signal problems and broken rails, all while reducing scheduled rush-hour service to Penn Station to accommodate construction work.